Galaxy of Trian is a tile-based sci-fi strategy game where opposing forces race to control powerful technology in an ever-expanding galaxy. Planets, gas clouds and nebulae await intrepid explorers, where untold resources may be found inside ancient abandoned research stations. The "Beginning of Conquest" expansion introduces two new starships to Galaxy of Trian, the Rogue and the Corvette. These ships open up new gameplay options as materials may be confiscated and territories may be forcibly occupied. 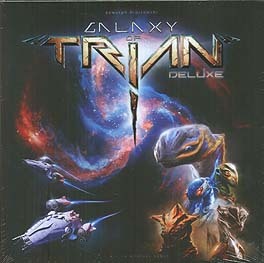 Get ready to battle for control in a whole new Galaxy of Trian.